© Black Sea Maritime Archaeology Project/EPA-EFE/Shutterstock An image of the vessel on the bottom of the Black Sea. Researchers used radiocarbon dating to show that the wreck dates back over 2,400 years. radiocarbon dating to show that the wreck dates back over 2,400 years. 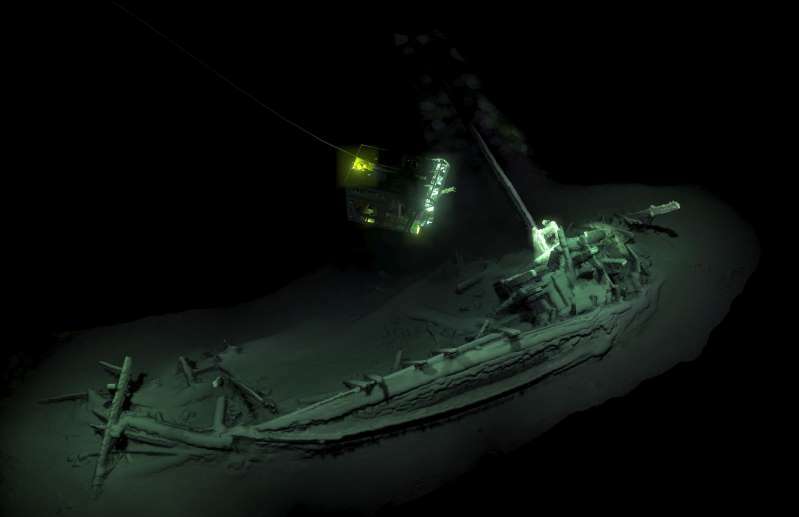 The oldest intact shipwreck has been found resting on the bottom of the Black Sea. Protected by the oxygen-free water at the seafloor, the ship has been sitting undisturbed since 400 B.C., researchers from the Black Sea Maritime Archaeology Project (Black Sea MAP) announced last week. It is a Greek vessel that looks like one the mythical hero Odysseus could have sailed — literally. According to the researchers, a similar vessel is painted on the side of the British Museum’s “Siren Vase,” which depicts Odysseus chained to the mast of his ship as it sails past the sweet-voiced sirens. The ship was discovered in fall 2017, on the third of three survey trips to the Black Sea. Led by Adams, Lyudmil Vagalinsky of the Bulgarian Academy of Science and Kalin Dimitrov of the Center of Underwater Archaeology in Bulgaria, the research team surveyed 770 square miles of the seabed during all three seasons. The investigations turned up more than 60 shipwrecks, including some previously reported to date back to the Ottoman and Byzantine empires. The Black Sea has only a narrow connection to the Mediterranean Sea, so it drains poorly. And the Black Sea is fed by freshwater from the surrounding land, which floats on top of the saltier water closer to the bottom. This salty layer is extremely low in oxygen, which keeps wood-eating microbes away from shipwrecks on the seafloor. For that reason, even centuries-old ships look as if they went down yesterday. The researchers used radiocarbon dating to show that the wreck dates back more than 2,400 years. The ship rests on its side, its mast and prow clearly visible and unbroken. The main goal of the Black Sea MAP is to understand changes that have occurred since the last ice age, when the sea was much lower. Because the area has been a hub of civilization, the shipwrecks at the bottom form time capsules, revealing who used the sea for commerce and how they built their vessels. The researchers have also excavated a settlement on the Bulgarian side of the sea near the Ropotamo River. The site tells a story of the Black Sea as melting glaciers raised sea levels and forced humans to adapt. In the lowest layers of the excavation, just over eight feet below the current seafloor, are timbers and hearth fragments from a Bronze Age settlement, the researchers previously reported. But by the Byzantine era (A.D. 330-1453), the site was inundated, and ceramics revealed that people used the spot as a safe harbor. By the Ottoman era (A.D. 1299-1920), the spot was a deeper anchorage for trading vessels.